Friday, October 11, 2013 7:00–9:30 p.m.
OHNY invites you to the 2013 OHNY Weekend Launch Party. Now in its eleventh year, OHNY Weekend is one of the most aniticipated and beloved cultural events in New York, opening up hundreds of buildings and sites throughout the five boroughs for public tours and talks. The Launch Party is a festive celebration to kick off each year’s OHNY Weekend. Pier 57, will host a variety of shops all housed in shipping containers. The pop-up market – Opening Ceremony By-The-Water, is open from Sept. 5 to Sept. 12 from 11 a.m. to 7 p.m. Clothing retailers include Rihanna for River Island, DKNY, and The Newsstand. There will also be the North Brooklyn Collective, which sells bikes, and food vendors Takumi Tacos, Better Being Underground, Cold Process Coffee, and La Sonrisa Empanadas. It’ll also be the location of Opening Ceremony’s first men’s and women’s runway show, which is scheduled for Sunday, Sept. 8, at 8 p.m. 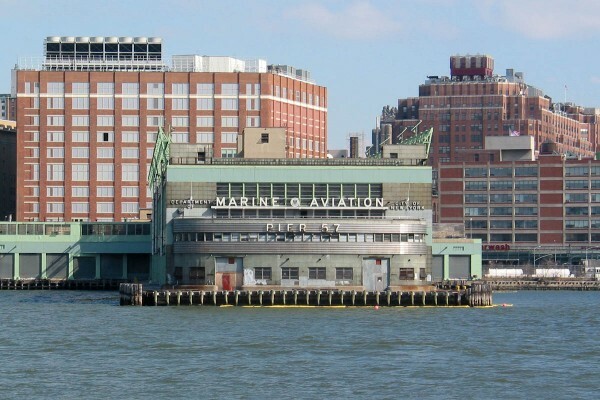 In July of 2009, Hudson River Park Trust designated Youngwoo & Associates as a developer of the historic Pier 57. Youngwoo & Associates was one of three companies seeking to redevelop the pier. Youngwoo & Associates (YWA) will transform Pier 57 into an innovative hub of cultural, recreational and public market activities, all located within a restored historic structure that will also create several acres of public open space on the Pier 57 rooftop and along a perimeter waterfront promenade. YWA’s plan for Pier 57 includes a 170,000 square-foot covered, open-air public market – to be programmed and managed by Urban Space Management (USM) and housed in part in recycled and creatively refitted shipping containers. The market will be New York’s first large-scale concentration of year-round, affordable work/sell space for artisans and other small businesses.